Bible-shaped Teaching, by Dr John Shortt, is essentially a book about stories and metaphors. Using stories from his own life, the author invites readers to consider the profound question of how the Bible shapes our lives and work as teachers. The Bible is God’s Big Story, the metanarrative of our Christian belief, and it’s a story that we each interpret through the filters of cultural viewpoint and personal experience. Rather than using traditional metaphors to describe the Bible (as lamp, satnav, map, rule book, foundation or spectacles through which to view the world), John suggests that we could see the Bible as an ecosystem within which we live, move and have our being. The beauty of this metaphor rests in its allowing for the different environments by which we are each shaped to remain inter-related within the bigger narrative. The education provision of every society is fashioned by a metanarrative. In the case of contemporary Britain, that dominant narrative is consumerism; the metaphor of the assembly line process communicates the underlying purpose. Each of our students has a personal story which overlaps with ours, but while the education system is connecting them to a secular, consumerist metanarrative, ours is connecting us to God’s story. We therefore use very different (Biblical) metaphors to show how we think of ourselves – we talk about being shepherds or gardeners. But is it enough just to see ourselves in this way? Or should the Bible take us further, into the very content of what we teach? The author suggests that being nice is not enough because our Christian virtues should impact on what we teach, not just on how we behave. We shouldn’t just study the Bible for ourselves; we should locate our teaching firmly within the bigger picture of God’s story (a Christian worldview), opening windows for our students onto God’s world and our connection with it. It’s not just about showing love and humility in the way we act; it’s also about how we work through the Biblical principles of justice, fairness, hospitality and humility in our subject content. To assist with the thinking on this, one chapter is devoted to considering Biblical teaching models, not just of Christ as a model storyteller, but also of Christ the Torah Teacher (providing rooted identity), Christ the Prophet Teacher (shaking up thinking by questioning and challenging) and Christ the Wisdom Teacher (how to live in the world and with one another). For me, the greatest strength of this book, pervaded by graciousness and humility, is its subtext. The author doesn’t just write about hospitality – he practices it in the way he invites the reader to join him on his journey. He doesn’t just write about Biblical models – he demonstrates Torah teaching by rooting his book in his Christian identity. He exemplifies Prophet teaching by questioning and challenging, and the book is imbued with the Wisdom teaching of how to live in the world and how to respect the stories’ of others whilst showing how our stories connect with God’s Big Story revealed in the Bible. 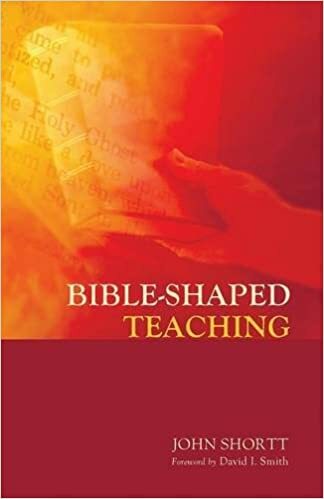 In one of several endorsements, Professor Trevor Cooling writes that Bible-shaped Teaching ‘offers a deeply Christian, deeply spiritual and deeply personal reflection’. It is an inspirational book for anyone who wants to be faithful not just to their vocation as a teacher but also to their vocation as a Christian.